ASSAMSTADT, GERMANY -- (Marketwired) -- 09/05/14 -- The launch of ecom's new hazardous area tablet computer solution Tab-Ex® series triggers a paradigm shift in the way mobile workers work and interact with each other, their remote experts, and the backend systems. This way of working brings with it the opportunity for improved decision making, improved mobile worker collaboration, and new levels of efficiency and collected data quality related to work tasks performed in hazardous areas. "BP sees great promise in the use of mobile devices in hazardous areas for improved data collection quality and access to documents." Michael M. Haley, Technology Consultant, BP Chief Technology Office. Recognising that many work tasks are performed in both non-hazardous and hazardous areas, ecom is launching an entire family of compatible tablets, peripherals and accessories suitable for worldwide use in Zone 1/Division 1, Zone 2/Division 2, and rugged environments. The first in this series of tablets will be available in production quantities in 4Q2014, with further versions being available soon after. Lightweight and compact, operating on Android Kitkat 4.4, the Tab-Ex® is suitable for multiple mobile worker roles performing a range of applications, including Asset Surveys, Material Tracking, Operator Rounds, Inspection and Maintenance. The 8" screen enables standard desktop applications to become mobile in hazardous areas, allowing workers to view and interact with SCADA/DCS systems, enterprise systems (SAP, Maximo), and computer aided design systems, when they are moving around the hazardous area. Augmented reality and video conferencing also become much easier to use with Tab-Ex®. 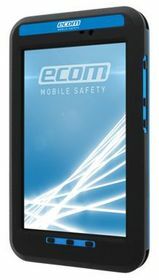 Ecom´s development of the hazardous area tablet Tab-Ex® includes numerous new patents and is built on the Samsung GALAXY Tab Active platform. The state-of-the-art tablet GALAXY Tab Active offers amongst others IP67 Water & Dust Resistance, Anti-shock 1.2m Drop Test with included cover as well as easy handling and lightweight, an auto-focus camera (with flash) for barcode scanning and Samsung´s warranty packages. This way hazardous and harsh environment users are enabled to gain of Samsung´s benefits along the compatibility and the whole range of preloaded applications of the Samsung device for a safer and more secure work environment with unparalleled security functions like device encryption, MDM, VPN and secure connectivity (Samsung KNOX). "The state-of-the-art GALAXY Tab Active product with its unique features is the ideal platform for ecom to take the challenge in developing the world´s first Zone 1 / Div. 1 tablet computer for hazardous areas. The partnership with Samsung enabled us to gain benefits of the GALAXY Tab Active to hazardous area users and industries. In striving to make the daily work cycle as effective as possible, we rely on strong partnerships and close development co-operation with the world market leaders in non-explosion-protected products." Rolf Nied, founder and Managing Director at ecom instruments. The ecom Tab-Ex® is showcased at the IFA 2014 in Berlin in Samsung Booth #101, exhibition hall A.